Every day, we work intensively to satisfy consumers in over 170 countries across 5 continents, to lead the confectionary and sweet packaged food industries. To achieve all this, we rely on the passion and expertise of men and women who are committed to lending their talents and working in harmony with Ferrero's different operational areas. Over the years, our organizational structure has evolved to support Ferrero's global expansion into new markets. The Group is managed from our headquarters in Luxembourg, the strategic hub where our central functions are based. Each of our local offices has a pivotal role in crafting our brands in line with the central business and the specific needs of each territory. If you're ready to express the very best of yourself we invite you to be part of a team that reaches results through competence and teamwork. Because here at Ferrero, each of us plays a crucial role in winning the hearts of consumers all over the world. 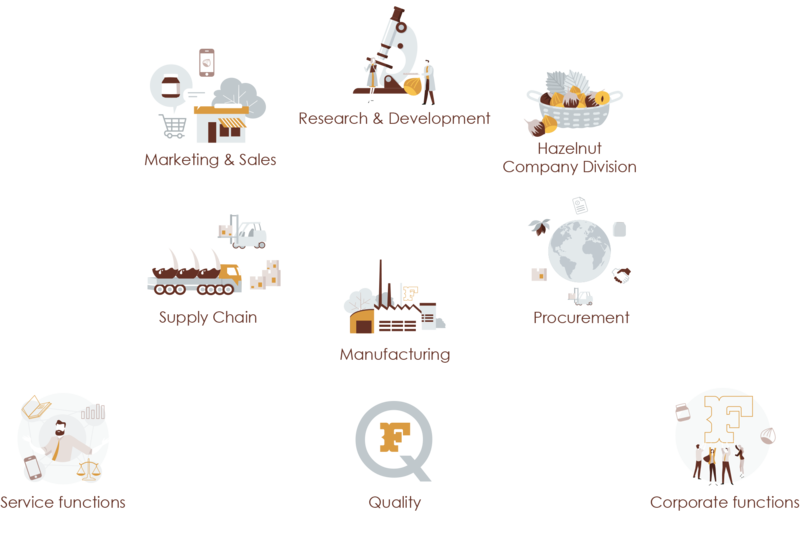 Explore the departments behind our Value Chain by clicking on the links below.